The 110 has been around for forty years and you'll find plenty of people who have knives that have been in good working condition for thirty or more. These days, knives are constructed from 420 high-carbon steel. 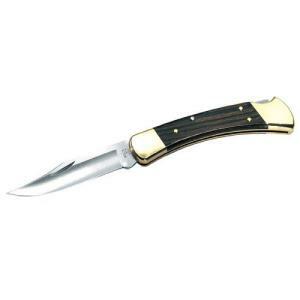 The 3.75 inch blade features a clip point and a pronounced nail nick for easy opening. The blade is very sharp out of the box. The lockback and opening mechanisms are both smooth and rugged, while the handle is a natural wood and features brass bolsters and accents. This is a substantial knife, weighing in at 7.2 ounces, so be aware of that before buying. Included is a leather sheath. '57 Chevy sold separately.